In desperation to warm up some tight muscles before a deep-tissue massage appointment, I headed out of the office for a brisk walk, last evening. About 10 minutes into it, I determined that it wasn’t working, or rather, I found a more attractive idea: go home, run a hot bath while fixing a quick dinner, soak a bit, then eat and head for the therapist with the strong hands. Heading back toward the car briskly, I spied a new visitor to my familiar route. The path goes along the edge of a lagoon, which I think is a former marina, and it often has at least one of the following present: Great Egrets, Great Blue Herons, Osprey, Bald Eagles, and some sort of hook-billed water bird, perhaps a cormorant. 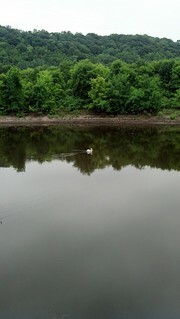 This visitor was large and white, so I first thought it was an egret; there were two over where the lagoon meets the Mississippi river. This bird was floating, or rather, swimming as waterfowl do, but not as I’ve ever observed egrets to do. And it was big. Swan? No, neck not long enough, and the beak was certainly too long to be that of a swan. Spoonbill? I’ve seen a roseate one before, but only in Florida, and a quick glance at my Birds app (Android) determined that there isn’t any spoonbill species that would ever be in Minnesota. Then it turned its head. Bingo! Throat pouch. A wonderful bird is the pelican, His bill will hold more than his belican, He can take in his beak Food enough for a week, But I’m damned if I see how the helican. On that note, I’ll end my fowl soliloquy and supply an update on our vegan-before-6 diet: it’s going well. I’ve lost a few pounds and have newfound interest in legume recipes and injera bread (for delivering said legumes to my beak). Planning breakfasts and lunches has gotten interesting! I think my midday energy has improved, though it didn’t really need help: at two recent afternoon kettle bells classes, my muscle endurance seemed improved. There are plenty of factors here at work (chiefly: I’ve been running a lot less than usual), but it’s possible that the plant-based diet is making an impact on my energy level. One last nature-themed note: during my walk, I was listening to a podcast that paired nicely with my pelican sighting (and not just because he was alone and fairly quiet): On Being’s “The Last Quiet Places” episode. I recommend it, not just because it’s a good listen, but because I’d love to hear your thoughts on it. Is silence on the verge of extinction? ‹ PreviousVegan before six? Okay.